Member of the core planning team for 6for6 and a doctoral candidate with a focus on medical education at Memorial University of Newfoundland (MUN) in St John’s. The primary investigator for the 6for6 project, former Director of Faculty Development in Family Medicine at MUN, and a family physician. Student in social work at MUN and was a research assistant for 6for6. Member of the core planning team for 6for6, a family physician practising in rural Newfoundland and Labrador, and Associate Professor at MUN. Member of the core planning team for 6for6, an epidemiologist, and Assistant Professor at MUN. The research assistant for the 6for6 program. Director of the Primary Healthcare Research Unit, Professor in the Discipline of Family Medicine at MUN, and a family physician. Problem addressed To address barriers challenging the engagement of rural and remote family physicians (RRFPs) in research, Memorial University of Newfoundland in St John’s has developed a longitudinal faculty development program (FDP) called 6for6. Objective of program To establish and evaluate a longitudinal FDP that promotes a foundation of research activity. Program description Informed by a needs assessment in phase 1, phase 2 saw the 6for6 curriculum designed, developed, and implemented to reflect the unique needs of RRFPs. Preliminary evaluations have been conducted and results will be presented after year 1 of the program. Conclusion The 6for6 FDP has been positively received by participants, and it is evident that they will serve as champions of rural research capacity building. It is anticipated that by April 2017, 18 RRFPs will be equipped with the research and leadership skills required to foster research networks within and outside their communities. Memorial University of Newfoundland (MUN) in St John’s has responded to these issues by developing an evidence-informed longitudinal FDP for RRFPs called 6for6. The 6for6 program is a research skills development opportunity for RRFPs developed in 3 phases. Phase 1 was a mixed-method, targeted assessment of the needs of RRFPs (page e80)9 to inform phase 2 (curriculum design, development, and implementation), which is detailed in this report. Phase 3, program evaluation, will be reported in a future article. Short-, medium-, and long-term objectives were identified. Short term: To identify and prioritize skills and services that RRFPs need to engage in research. Medium term: To establish and evaluate a longitudinal FDP that promotes a foundation of research activity. Medium term: To facilitate a process for knowledge translation and social capital10 building among RRFPs to build and support strong rural family medicine research capacity. Long term: To demonstrate improved rural patient outcomes through relevant research. Reprinted from Kern DE, Thomas PA, Hughes MT, editors. Curriculum development for medical education: a six-step approach. ©1998, 2009 The Johns Hopkins University Press. Reprinted with permission from The Johns Hopkins University Press. The 6for6 curriculum comprises 6 structured, face-to-face sessions at the main campus in St John’s and e-learning activities at a distance. Session content (Table 1) focuses on the priority research topics identified in phase 1. Experts and presenters are invited by the research team to teach the topics and develop teaching materials that are reviewed and approved by the core planning committee and the Health Research Ethics Authority. To prepare participants for each upcoming session, consolidate participant learning after each face-to-face session, and maintain participants’ skills, presession and postsession curriculum and activities are provided. Individual work is required between the face-to-face sessions and includes e-learning modules, readings, online discussion questions, e-learning assignments (case-based or problem-based activities), and audio- or video-based activities. Participants also fill out evaluation forms electronically before and after completion of any presession or postsession work. Each session follows a similar agenda (Box 1) with minor edits based on participant feedback. Mealtimes double as social time, allowing participants to form relationships that could extend academically into a research network. Overall, participants appreciate this format, particularly the highly interactive curriculum delivery, the balance between formal curriculum delivery and time to “learn by doing” through dedicated time to work on research proposals, and meeting with the research assistant (RA), librarians, and mentors. The agenda also provides substantial time for participants to work on their proposals and projects, helping to address the self-reported lack of research skills and challenges associated with limited time to do research. The 6for6 program is designed around learner-centred principles including active, social, and contextual learning. Participants conduct their own independent research projects on real-world issues in their practices or communities, are taught to conceptualize the project in the context of a framework, and are connected with MUN faculty with similar research interests. Given the personal relevance of these projects, participants are also intrinsically motivated and take ownership of their learning. Further, the curriculum and scheduling are founded on a needs assessment, and a participatory action approach is used for “reflection in action.”13 Participants occasionally request agenda changes during sessions, which are accommodated if possible. Changes are also made based on postsession and postprogram feedback. Adjustments are also made to accommodate participants’ “life issues” that challenge full participation (eg, becoming a new parent, children’s illnesses) using flexible program delivery (eg, connecting participants to face-to-face sessions via teleconference), making 6for6 inclusive and respectful of participants’ personal situations. The 6for6 program uses a blended learning model with synchronous (instructor-led) and asynchronous (self-paced) learning approaches, and didactic and e-learning instructional strategies including podcasts, mobile learning, case- and problem-based learning, group discussion, and in-class activities to consolidate and confirm learning. An Internet portal (www.6for6.ca) was created to house curriculum content, resources (eg, evaluation tools, handouts, and schedules), discussion boards (for group and individual discussion with mentors), and personal reflection or note-taking journals. Each participant has access to their own portal, and committee members have administrative access to discussion boards and to upload resources. Curriculum content in the portal is organized chronologically according to the timing of the face-to-face sessions. All curriculum content from before and after the face-to-face sessions is expected to be completed 1 week before and 3 to 4 weeks following the face-to-face sessions, respectively. The infrastructure of 6for6 is based on findings from phase 1. Participants are provided dedicated time and space to work on research activities and to collaborate with their peers. Partnerships with on-site departments and services (including library services, professional development conferencing services, and ethics) help participants build and formalize research networks and research communities of practice4 both within and outside of their respective communities. Librarians and ethics officers not only provide support to our participants, but also teach relevant topics during our face-to-face sessions and develop online learning modules as part of the presession and postsession curriculum, making them critical to the success of 6for6. The RA assists with activities relevant to participants’ research projects, helps participants between face-to-face sessions, reminds participants of presession and postsession curricular work, and connects participants with on-site research services (eg, librarians, ethics officers, and mentors). The RA also aids with research activities (eg, literature searches, annotated bibliographies, proposal writing, and data collection and analysis), coordinates face-to-face sessions and uploading curricular content to the portal, and tracks participant progress. The RA’s role will also be vital to the ongoing research success of 6for6 alumni. Over 3 years, 6for6 will accept 18 RRFPs (6 per year) to complete 12 months of a research curriculum. These physicians live and work in small communities throughout Newfoundland and Labrador (NL), New Brunswick, and Nunavut and have part-time appointments as clinical teachers with the Faculty of Medicine at MUN. Although participants vary in practice experience, none has previous advanced research training or experience. We have developed a 2-phase application process whereby individuals submit a letter of intent describing their interest in 6for6 and their ideas for a research project. The committee reviews their applications and ranks the top 10 applicants based on the scientific merits of the letter of intent, the geographic representation, and 6for6 objectives. The top 10 ranked applicants are then invited to submit a formal application, which includes sign-off by their medical directors regarding time away from work to both participate in the face-to-face sessions and complete other program requirements. These applications are then ranked by the core planning committee until consensus is reached. Program evaluation is in progress and performed at all levels to include 6for6 participants, the core planning committee, and mentors using focus groups and surveys. Feedback is also sought informally from participants throughout the program, particularly during face-to-face sessions, and is integrated into future sessions. Quantitative and qualitative findings from the evaluation of the first 3 sessions have been extremely positive and suggest a high degree of participant satisfaction and self-perceived growth in research knowledge, skills, and application abilities. Evaluation data will be reported following the first iteration of the program and as a complete 3-year pilot. The 6for6 program is designed with the practice context of potential learners—busy RRFPs—in mind. Our approach of constructing 6for6 around a needs assessment is an improvement over similar FDPs that did not use an evaluation of participant needs to inform curriculum development.14–17 Although at the time of writing we had not completed the first iteration of 6for6, we had 6 engaged and productive RRFPs, each pursuing a research question highly relevant to the communities in which they practise (Table 2). Participants are enthusiastic and it is evident they will serve as champions of rural research capacity building. With the expansion of medical schools to more distributed teaching, 6for6 responds to the need for innovation by addressing the unique challenges to research for physicians in rural and remote communities. This adds to the capacity of the community at large. Given our geography and participant distribution (40% of the NL population is rural with potential participants living up to 1000 km away from the Faculty of Medicine and in very remote northern settings), RRFPs are broadly distributed in NL. The 6for6 program is therefore a critical tool to alleviate barriers to research engagement by promoting a foundation of research activity among RRFPs and linking physicians with one another and with resources at MUN to enhance knowledge translation and social capital building, and, ultimately, to strengthen rural family medicine capacity in NL. At its core, 6for6 is an FDP developed specifically for RRFPs. Our strategy of constructing 6for6 around a targeted needs assessment is therefore crucial, ensuring that the needs of this population were central to development and thus directly addressed by the resulting program. Beyond the needs assessment, several other factors are also essential, such as the commitment of stakeholders including the Dean of Medicine and the Chair of Family Medicine, who together have supported 6for6 through funding and enthusiastic endorsement. Often participants complete a program, return to busy practices, and continue to face the same challenges that impede rural research, resulting in delays or abandonment of research ideas. Thus another critical component of 6for6 is the postprogram support we aim to provide to alumni. Mentors will continue to offer a guiding hand of expert advice on participants’ research projects, while the RA will connect participants with services on campus and continue assisting with research activities including paper editing, data coding and analysis, and interviews. We anticipate the creation of an institute of rural and remote primary care research to provide dedicated resources, space, and support for 6for6 alumni to continue with their research projects and receive ongoing support, motivational contact, and networking. The 6for6 program should be interpreted considering its limitations. Our situation might be unique in that our dean recognized the financial constraints that limit faculty development initiatives and gave us a dedicated budget to cover infrastructure costs. We also have access to expert mentors to support participants, a resource potentially unavailable to other faculties of medicine. Our rural family physicians are engaged in the mission of the Faculty of Medicine more broadly, which has perhaps facilitated their enthusiastic involvement. We can report only on our short-term objectives, as we had not yet finished the first iteration of 6for6 at the time of writing. In phase 2 of 6for6 we designed, developed, and implemented a curriculum around the needs of RRFPs,9 creating a longitudinal FDP that achieves our stated objectives. Our program promotes a foundation of research activity among RRFPs and links them with one another and with resources at MUN, in order to enhance knowledge translation and social capital, and, ultimately, to strengthen rural family medicine capacity in NL. By April 2017, 18 RRFPs will be equipped with the research and leadership skills needed to drive the province toward improved rural patient outcomes through relevant research. The 6for6 program has been funded by the Dean of Medicine at Memorial University as a 3-year experimental project, with an annual budget of $100 000. Participants are individually paired with expert researchers to help them throughout 6for6 with the curriculum content and with integrating the content into their research plans. All mentors are provided with mentorship support through expert-guided face-to-face discussions, resources like coaching strategies, and a sample timeline for meeting program outcomes. Few faculty development programs (FDPs) support research skill development among rural and remote family physicians (RRFPs), in spite of their having greater barriers to research engagement, including geographic and professional isolation. Memorial University of Newfoundland (MUN) in St John’s created an FDP to address this need for RRFPs. The 6for6 curriculum, developed after a needs assessment, comprises 6 structured, face-to-face sessions at the main MUN campus and e-learning activities before and after sessions. Each year the 6 RRFP participants identify a research question that is relevant to their individual practices or communities, and 6for6 connects them with mentors and other resources through MUN. Preliminary evaluations of the program have been positive. Formal evaluation is under way. Rares sont les programmes de perfectionnement professoral à l’appui du développement des compétences en recherche à l’intention des médecins de famille ruraux et éloignés (MFRE), même s’ils sont aux prises avec les plus importants obstacles à leur participation à la recherche, y compris l’isolement géographique et professionnel. L’Université Memorial de Terre-Neuve à St. John’s a élaboré un programme de perfectionnement professoral pour répondre aux besoins des MFRE. Le cursus 6for6, élaboré à la suite d’une évaluation des besoins, comporte 6 séances structurées auxquelles on assiste en personne au campus principal de l’Université, de même que des activités d’apprentissage électronique avant et après les séances. Chaque année, les 6 MFRE participants proposent une question de recherche pertinente à leur pratique ou à leur communauté, et le personnel de 6for6 leur assigne des mentors et d’autres ressources par l’intermédiaire de l’Université. Les résultats des évaluations préliminaires du programme se sont révélés positifs. L’évaluation formelle est en cours de réalisation. All authors contributed to the concept and design of the program, the needs assessment, and preparing the manuscript for submission.
. Improving health globally: a critical review of the necessity of family medicine research and recommendations to build research capacity. Ann Fam Med 2004;2(Suppl 2):S5-16.
. The evolution of faculty development in Canada since the 1980s: coming of age or time for a change? Med Teach 2010;32(1):e31-5. , editor. The CanMEDS 2005 physician competency framework: better standards, better physicians, better care. Ottawa, ON: Royal College of Physicians and Surgeons of Canada; 2005.
. Developing an empirical account of a community of practice: characterizing the essential tensions. J Learn Sci 2002;11(4):489-542.
. The challenges and rewards of rural family practice in New Brunswick, Canada: lessons for retention. Rural Remote Health 2009;9(2):265-74. Epub 2009 May 25.
. Research electives in rural health care. Can Fam Physician 2002;48:1476-80.
. An assessment of British Columbia rural physicians’ continuing professional development needs. B C Med J 2009;51(6):250-5.
. Factors influencing rural health care professionals’ access to continuing professional education. Aust J Rural Health 2006;14(2):51-5.
. Needs assessment for development of 6for6. Longitudinal research skills program tailored to rural and remote family physicians. Can Fam Physician 2016;62:e80-8.
. The measurement of social capital. Gac Sanit 2015;29(1):62-4.
, editors. 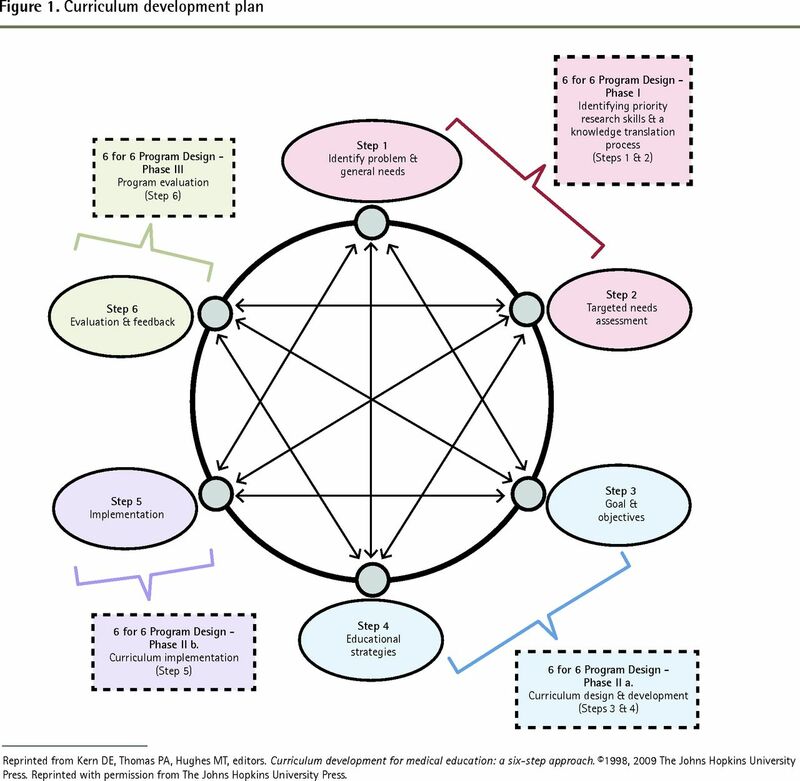 Curriculum development for medical education: a six-step approach. Baltimore, MD: The Johns Hopkins University Press; 2009.
. Adult learning processes: pedagogy and andragogy. Relig Educ 1977;72(2):202-11.
. The reflective practitioner: how professionals think in action. New York, NY: Basic Books; 1983.
. The researcher development program: how to extend the involvement of Australian general practitioners in research? Rural Remote Health 2007;7(3):776. Epub 2007 Aug 14.
. Research methods courses for GPs: ten years’ experience in southern Sweden. Br J Gen Pract 2000;50(459):811-2.
. Five weekend national family medicine fellowship. Program for faculty development. Can Fam Physician 1997;43:2151-7.
. Family medicine research capacity building. Five-weekend programs in Ontario. Can Fam Physician 2010;56:e94-100. Available from: www.cfp.ca/content/56/3/e94.long. Accessed 2016 Jan 15.